Syria’s embattled President Bashar al-Assad says he believes the unrest roiling the country is coming to an end while acknowledging that security services had made mistakes in trying to tame a two-month revolt threatening his regime. Assad made the assertions in a meeting with a delegation of dignitaries from the Medan district of Damascus, a commercial zone, according to Wednesday’s edition of the Arabic-language daily Al-Watan, close to the government. “President Assad gave assurances that Syria had overcome the crisis it went through and that events (shaking the country) were coming to an end,” the private daily quoted him as saying, without specifying when the meeting took place. Assad also acknowledged wrongdoing on the part of security services, attributing it to lack of training for such circumstances which, he said, are usually handled by police, according to the paper. It quoted him as telling members of the delegation that 4,000 police officers were currently undergoing training in order to avoid further mistakes. “The role of the security services is to gather information, analyse it and hand it over to the proper authorities,” a member of the delegation quoted the president as saying. Assad’s authoritarian regime has sought to crush the greatest challenge to nearly five decades of rule by his Baath party with a brutal crackdown that has left more than 850 people dead and at least 8,000 arrested, according to rights groups. Although the opposition has the odds stacked against it, it has pushed forth with pro-democracy protests and, in a defiant move, called for a general nationwide strike on Wednesday that largely went unheeded. Schools, shops and transport were operating normally in Damascus and other cities but an activist told AFP that a popular district of Aleppo, the second largest city, was affected as was the university campus. “Only students and staff are being allowed on the campus,” activist Moustapha Suleiman told AFP. He said 2,000 people were also demonstrating in early afternoon in the town of Ifrin, north of Aleppo. His account could not be independently verified as journalists are not allowed to travel freely in the country to cover the unrest. 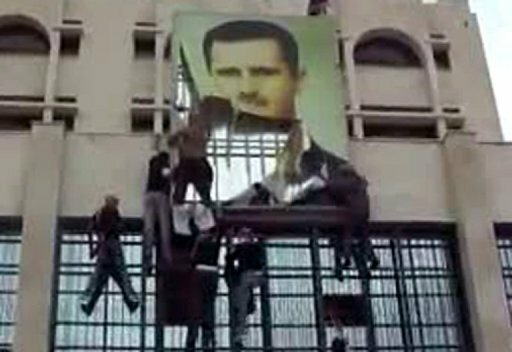 The Syrian Revolution 2011, an Internet-based opposition group, had called for the strike in the hope of piling further pressure on the regime. But several people interviewed in the capital Damascus, which has largely been spared the unrest so far, said no one would dare answer the call. “Who would dare go on strike and risk losing their business or be targeted by authorities?” said one businessman who requested anonymity. Another merchant said the strike was of little use given that customers had all but dried up since the security forces began violently putting down the protests that broke out two months ago. The United States and European Union, which have slapped sanctions on members of Assad’s inner circle, warned Tuesday that further measures were being considered against the regime. But Syrian authorities so far have appeared impervious to outside pressure, pushing ahead with a campaign that has consisted of laying siege to restive town by restive town while arresting thousands of protesters and opposition figures. Some of those released have said they were tortured and others have been forced to sign pledges not to take part in further protests.